Delivering software to multiple users in your organization is no minor task. Managing licenses, updates, rollouts, and standardization can be a time-consuming and costly process. Having a system that helps you manage software delivery, updates, and license renewals can save time that otherwise can be spent on more productive tasks. SDC facilitates software development by providing the right tools at the right time, with minimal effort. Tool environment and maintenance is no longer a concern for your engineers – and it’s simplified for administrators. Team leads managing the development environment need to address the array of requests from their teams. Leveraging SDC makes it simple for a single administrator to create advanced configurations with minimal effort. Engineers joining companies, moving between teams, or starting to develop the next major release of your product must prepare their development environment. SDC facilitates on-ramping in minutes by providing the right tool stack ready to use. SDC allows engineers to stay up to date with the latest setup for development, making it easy for the team lead to ensure everyone on the team has the same tools & configuration. SDC allows configuration of an entire toolstack with all needed add-ons. Let your best engineers lead by example and point-and-click their way to a secure and highly managed development environment. 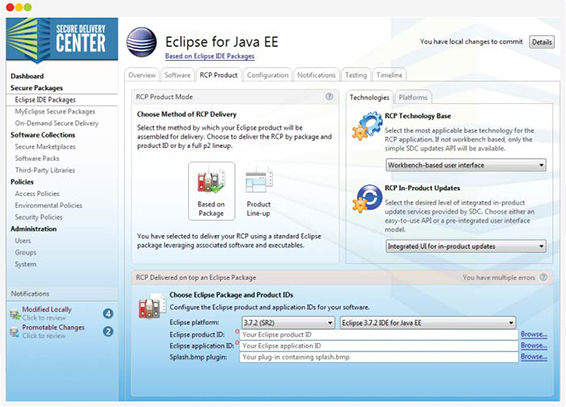 SDC offers a collection of the most popular Eclipse plugins, certified for code integrity. Don’t hope that your plugins will work or that they won’t harm your stack. 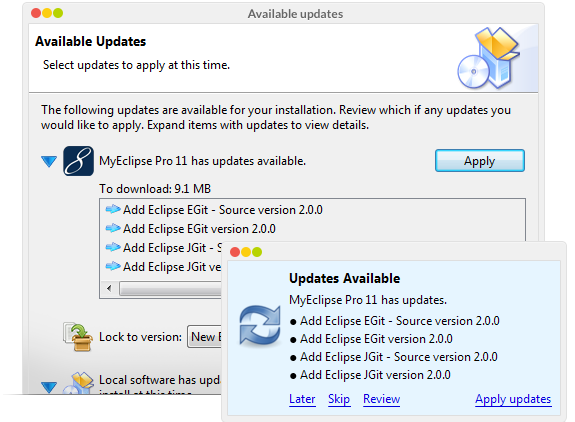 Certified Eclipse plugins – updated quarterly – take the stress out of OSS. When building Rich Client Platform applications, you want flexibility to maintain product identity within a platform that lets you focus on software building—not update and delivery management. SDC gives you freedom to stay on task by automating the process of RCP application delivery, installation, and providing updates. SDC allows you to have both at-a-glance and detailed reports of tooling usage. 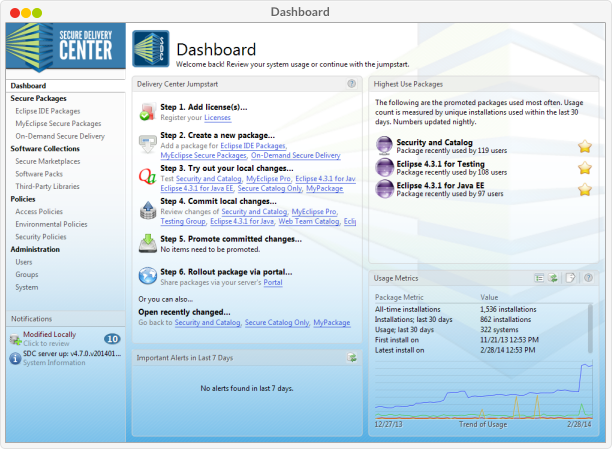 Track the number of installations by package, the highest use packages, and promotion dates. Not only will you know what is being used by your developers, you can also track compliance with company initiatives or licensing concerns. All data is exportable for use in external programs if desired. SDC provides your developers with full tool stacks in easily-consumed formats. A designated entity – such as a tooling group – creates a sanctioned tool stack with all desired plugins, preferences and settings, and then distributes installers to development teams. Use the same mechanism to push stack updates (forced or optional – your choice). Not everyone wants to lock down tool stacks, but for some applications, it’s absolutely critical. SDC includes the simple, one-click ability to disallow changes to tool stacks, or limit changes through use of certain update sites (such as your own internal site). You can be as friendly or as restrictive as you need to be on a per-package basis. Provide your development teams with a secure catalog of OSS, commercial and your proprietary plugins from your private, behind-the-firewall Eclipse Marketplace. Update sites and plugin versions change constantly and bring the risk of compromised tooling. Make sure your developers get their favorite tools from the most trusted source – your company. Awesome right? Download it now! Don’t wait! See how easy it is to point-and-click your way to delivered software. Give it a try now!